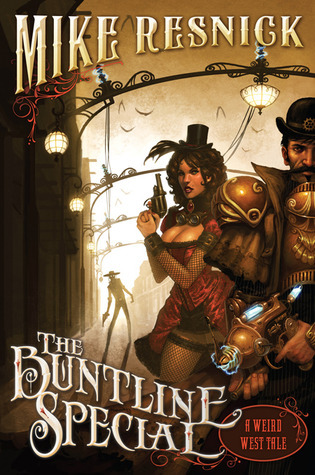 ‘The Buntline Special’ is an incredible steampunk novel written by famous American author and five-time Hugo winner Mike Resnick.It shows readers the world of the mysterious western. 1881, the alternative history. The United States of America desperately wants to expand its territory. But the magic of the Indian nations that lies beyond the Mississippi River prevent them from doing it. Thomas Alva Edison, inventor and scientific, is asked by an American government to find scientific ways in the famed western town of Tombstone, Arizona, to counteract the magical power. Wyatt Earp and his brothers will accompany Edison on this tough trip to guard and protect him. There are a lot of people who want to see Earp brothers and Edison dead. Doc Holliday and Bat Masterson will try to help Thomas and manufacturer of his inventions, Ned Buntline. Against them will fight American Indian wizard Geronimo and the Clanton gang with raised from the dead violent sharpshooter Johnny Ringo, the one who can resist Doc Holliday. You still think you know the O.K. Corral’s story? Resnick has made the plot twisted and unpredictable. Only the fact that The United States has not crossed the West yet stirs the interest of readers. The strong main characters who are always active, brave and ready for fight add to the atmosphere of the real western. But there are a lot of weird and strange details which stand this storyline out from the rest. For example, cyborgs, spells, that transform people into different creatures, and even living dead. Moreover, Thomas Edison, known worldwide as the inventor of the light bulb, invents different technical gadgets for cowboys. All that attracts the readers’ attention. This fascinating book is highly recommended for those who is fond of Wild West and steampunk fantasy.